The elbow joint joins the humerus, the upper arm bone, to the radius and ulna. All of these bone ends are covered with a smooth form of cartilage that lets the bones glide easily on each other, so the dog can flex and extend his elbow like a well-made hinge. As the joint develops problems in the cartilage or bone arise, this means the joint is unable to articulate or move normally. A knock on effect of elbow dysplasia is secondary osteoarthritis as the joint is unable to move normally wear and tear on the joint starts to occur early on. In some forms of elbow dysplasia the cartilage is forced to wear away causing the dog pain and discomfort which usually manifests as lameness. Elbow dysplasia is more painful and restricting than hip dysplasia and is usually bilateral (in both elbows). There are also usually arthritic changes. 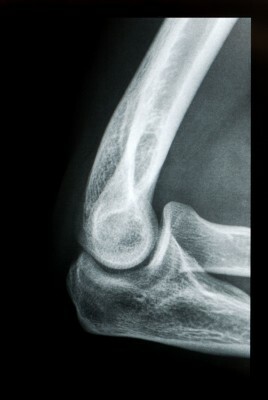 Severe elbow dysplasia is usually treated surgically, and appropriate exercise is vitally important to maintain muscle mass to help improve the stability of the elbow joint, maintain endurance and cardiovascular fitness and maintain the health of the articular cartilage surrounding the joint. It is also important to reduce the level of pain in the joints. Hydrotherapy is an excellent way to encourage joint mobility and stabilise the joint through building up muscle mass quickly and safely. Consistent, regular, gentle exercise such as swimming is the key to effective management of elbow dysplasia in conjunction with regular medication and dietary supplements.